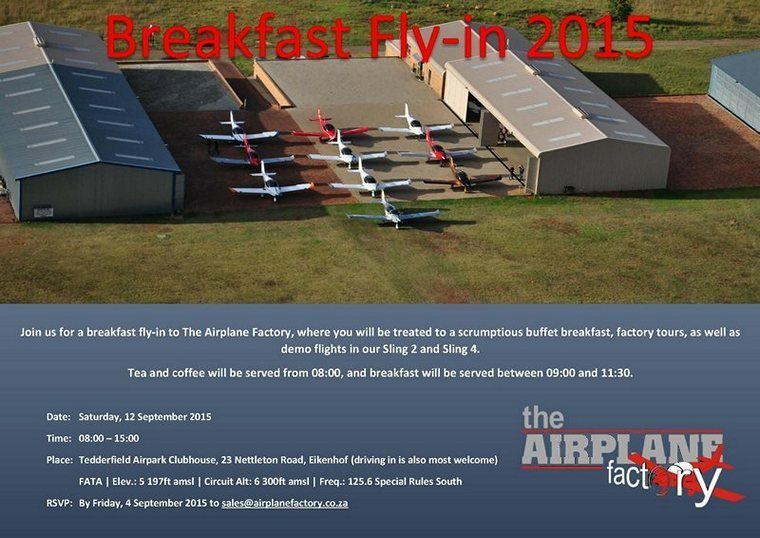 12 September: The Air Plane Factory fly in. 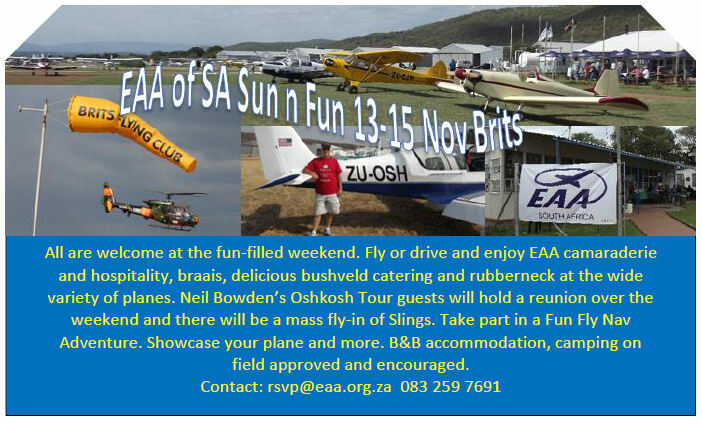 13 - 15 November: The EAA of SA Sun 'n Fun Fly-in to Brits will include the following: Peter Hengst Memorial Breakfast Fly-in of 14 November, Neil Bowden Oshkosh Pilgrims Reunion, Mass Airplane Factory Sling Fly-in and SAPFA organised 'Poker Run'. 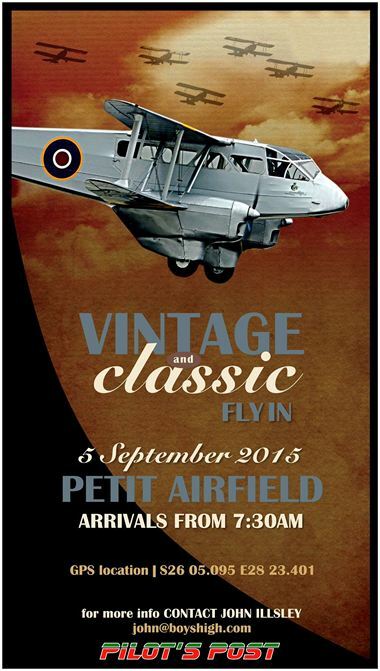 Camping on the airfield, numerous B&B accommodation in town. 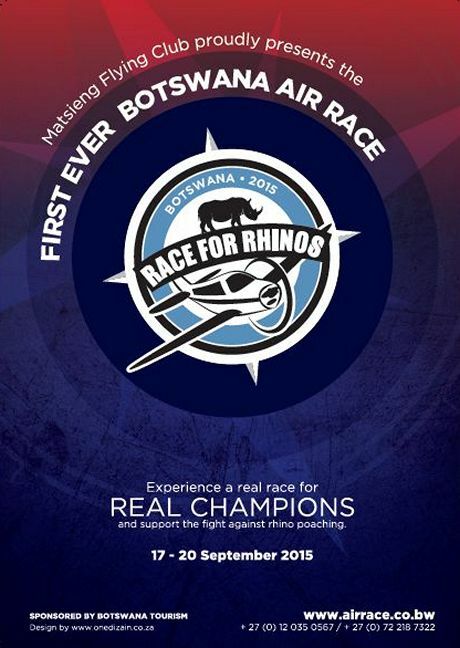 Braai on Friday evening at the BFC Clubhouse, sit-down dinner on Saturday - come and experience bushveld hospitality and EAA camaraderie with the famous delicious catering of BFC. All aircraft and pilots welome. September 2 1930 - The first nonstop airplane flight from Europe to the United States was completed in 37 hours as Capt. Dieudonne Costes and Maurice Bellonte of France arrived in Valley Stream, N. Y., aboard a Breguet biplane. September 2 1910 - Blanche Stuart Scott makes the first solo airplane flight by a woman in the United States subsequently recognized by the Early Birds of Aviation. September 3 1955 - J. S. Fairfield makes the first ejection from an aircraft on the ground, escaping from a Gloster Meteor traveling at 120 mph (193 km/h) along a runway. September 4 1950 - Cpt Robert Wayne becomes the first pilot to be rescued from behind enemy lines by a helicopter. September 5 1908 - Goupy No.1, is the world's first triplane. The French Goupy, was built by Ambroise Goupy, it has three sets of wings; each stacked above the others and is powered by 50-hp Renault engine. September 6 1948 - A de Havilland DH.108 breaks the sound barrier, the first British aircraft to do so. September 7 1997 - First flight of the Lockheed Martin F-22 Raptor. It reaches an altitude of 15,000 feet in less than three minutes. September 7 1956 - The Bell X-2 research aircraft is flown by Captain Iven C. Kincheloe to a new altitude record of 126,200 ft (38,466 m). September 8 1999 - The Helios Prototype flew for the first time at Dryden. The Helios is a research aircraft developed to demonstrate the ability to reach and sustain horizontal flight at 100,000 feet altitude on a single-day flight, and to maintain flight above 50,000 feet altitude for at least four days, both on electrical power derived from non-polluting solar energy. The flight concluded prematurely after a small parachute, designed to keep the aircraft within a restricted airspace zone over the lakebed in case of a loss of control, unexpectedly deployed after an apparent electrical system failure. September 8 1927 - The Cessna company is established. Peru: The Peruvian National Congress approved the country's Airspace Surveillance and Control Law on August 20. The new law authorises the Peruvian Air Force (FAP) to shoot down aircraft that fail to comply with instructions to land if they are suspected of carrying drugs, weapons, or biological agents. UK, London: A Nigerian Arik Airline flight attendant was arrested at Heathrow Airport after about 44 pounds of a substance that tested positive as cocaine was found in her possession. US, Las Vegas: The pilots of a MD-83 abruptly halted their take-off run roll when a fault in the elevator caused the aircraft's nose to rise prematurely. Primary flight controls on airliners are so critical to safe operations that they must be designed to essentially never fail. The loss-of-control was reported to the NTSB, which investigates aircraft accidents. Bulgaria, Varna: A Bulgarian government Falcon aircraft with Prime Minister Boiko Borissov on board made an emergency landing at Varna Airport after problems with the plane's landing gear. USA, Kennedy Airport: Two passengers on the JetBlue flight from Jamaica were arrested at Kennedy Airport after a razor and pepper spray fight that started when one of them tried to "climb over" the other as the jet reached the gate. Jean Ballentine, 61, who was, was trying to leave her Row 21 window seat when the woman in the middle seat "pushed" her off. Ballentine then punched the other woman, Mary Cannady, 52, in the face, and when a man seated across the aisle intervened, Ballentine slashed him in the elbow with an eyebrow razor. At that point, Cannady got a small can of pepper spray from her pocketbook and squirted the eye-and-skin irritant onto Ballentine. Nigeria, Kaduna: A Dornier 228 light aircraft off the Nigerian Air Force crashed in Kaduna, Northwest Nigeria. The aircraft was said to be on its way to Abuja after taking off from the Air Force Base in Kaduna when it crashed at the old site of the Nigerian Defence Academy also in Kaduna, less than ten minutes after it took off. Skytrax, whose ratings are recognised as a global benchmark for airline standards has just released its annual world airline star ratings, ranking airlines by the quality of their front-line product and service standards. Topping the list as the world's worst airline is North Korea's Koryo Air. According to Skytrax, who ranks airlines I to 5 with one being the lowest, a two-star rating is awarded to airlines delivering a lower quality performance, below the industry quality average across many of the rating sectors. The ranking signifies poorer or inconsistent standards. Air Koryo, North Korea was the only airline to be rated One Star. Air Italy,Italy, Bahamasair, Bahamas, Biman Bangladesh, Bangladesh. Bulgaria Air, Bulgaria. China United Airlines, China, Cubana Airlines, Cuba, Iran Air, Iran, Lion Air, Indonesia, Mahan Air, Iran, Nepal Airlines, Nepal, Onur Air, Turkey, Pegasus Airlines, Turkey, Rossiya Airlines, Russia, Ryanair, Ireland, SmartWings, Czech Republic, Spirit Airlines, USA, Sudan Airways, Sudan, Syrianair, Syria, Tajik Air, Tajikistan, Turkmenistan Airlines, Turkmenistan, Ukraine Int'l Airlines, Ukraine and Yemenia, Yemen. Cirrus Aircraft announced that the FAA issued Type Inspection Authorization (TIA) for the Vision SF50, marking another significant milestone in the aircraft certification program. TIA initiates formal FAA flight evaluation of the Vision SF50 type design, airworthiness, performance and handling properties. This TIA allows Cirrus to move forward with FAA Conformity Inspections and Certification Flight Tests with an FAA pilot on board the aircraft, one of the final elements needed for Type Certification. The TIA comes after intensive scrutiny of engineering designs, structural testing and flight test results that demonstrate compliance with Federal Aviation Regulations. To achieve TIA from the FAA, Cirrus' first conforming flight test aircraft, C-Zero, was thoroughly analyzed in airframe structure, stability in flight controls and stall performance. The accumulated test hours and results deemed it safe to fly by the FAA and ready for compliance validation, a clear indicator of substantial progress along the Vision SF50's multi-year march toward first customer delivery. Three conforming Vision SF50 prototypes are working to demonstrate Type Certification compliance to requirements, already completing a wide range of company tests including the recent flyover noise levels. Recent successful completion of ultimate load drop testing for the signature Cirrus Airframe Parachute System� (CAPS�) paves the way for aircraft in-flight deployment testing this fall. Wing and stabilizer cyclic lifespan and stress testing are currently underway, updates to an advanced new avionics system, plus interiors and paint schemes are also being finalized. With the first Vision SF50 units entering the production line, Cirrus' goal is to achieve Type Certification by the end of 2015 and begin customer deliveries shortly thereafter. Korean Air, the flagship carrier of South Korea, welcomed its first Boeing 747-8 Intercontinental at a ceremony held at the Boeing Everett Delivery Center in Seattle. Present at the ceremony to celebrate the delivery of the aircraft, representing Korean Air, was the airline's Executive Vice President and Chief Marketing Officer Mr. Walter Cho and representing Boeing was its President and CEO for commercial aircraft, Mr. Ray Conner. 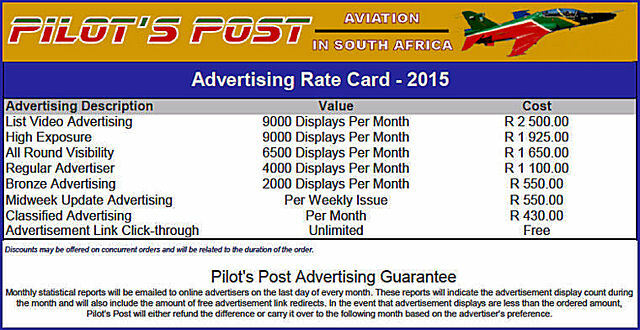 "This new aircraft delivers better fuel economy." Walter Cho said. "That's important to a global airline such as ours. And it supports our goal to build and operate a first-class fleet of world-class aircraft." With the addition of the B747- 8 Intercontinental to its fleet, Korean Air became the first airline in the world to operate both types of the B747-8. In 2012, Korean Air introduced the B747-8 Freighter and operates six of these aircraft. About 70% of the aircraft, by structural weight, incorporates new advanced aluminium alloys and carbon composites to reduce the weight drastically and giving a 16% improvement in fuel consumption and emissions over its predecessor the 747-400, while generating 30% less noise. With a range of 14,815km, the new B747 will be the fastest wide body passenger jet in the world with a normal cruising speed of Mach 0.86. Korean Air B747-8iKorean Air's new B747-8 Intercontinental is configured with 368 seats in a three-class configuration; 6 First Class, 48 Prestige Class (26 seats on the upper deck and 22 seats on the main deck) and 314 Economy Class. The aircraft also features Korean Air's brand new First Class Kosmo Suites 2.0 designed with a sliding door and higher partitions to provide added privacy for passengers. The suites are also equipped with updated in-flight entertainment systems, with large 24-inch high-definition monitors and new handheld touch remotes. The airline's Prestige Class Suites will feature staggered seating and privacy panels, along with 18" high definition touch screens. The aircraft also features an all-new, 787 Dreamliner-inspired interior that includes new curved, upswept architecture, giving passengers the feel of more space and comfort. Commencing September 2015, Korean Air plans to operate its B747-8 Intercontinental from Seoul on the Frankfurt and Singapore routes. The airline also plans to introduce the aircraft on the San Francisco and Hong Kong routes from November. Den Helder, The Netherlands 27 August 2015 - NHV Group has logged the first 1,000 flight hours with the H175, proving this super-medium-sized rotorcraft's capabilities and reliability in highly demanding operations, especially the transportation of crews and supplies to off-shore oil and gas platforms - the primary mission for which it was designed. The 1,000 hours have been accumulated by NHV's initial two H175s as the launch operator, which introduced these helicopters in service last December. The rotorcraft have since completed more than 750 flights and carried approximately 11.000 passengers; with certain missions conducted in challenging North Sea weather conditions, and non-stop flights performed to distances of 175 NM with passengers and cargo. High reliability with the H175 is enabling NHV to meet tight flight scheduling in the North Sea, thereby underscoring the aircraft's high level of maturity from service entry, as well as the suitability of associated services provided by Airbus Helicopters. The first two scheduled 400-hour maintenance checks validated the ease of maintenance. �The H175 is setting new standards in the super-medium rotorcraft category, with excellent marks received from NHV pilots and maintenance teams, along with the passengers being flown,� said Airbus Helicopters President Guillaume Faury. �Achieving this milestone with NHV highlights Airbus Helicopters' strong commitment to customer satisfaction and providing effective support to ensure a high availability of our helicopters�. 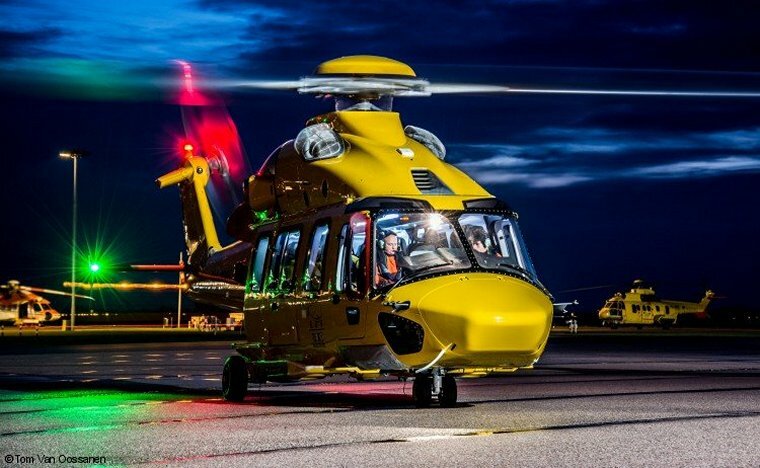 NHV's initial H175s are flying from Den Helder in northern Holland. NHV Group ultimately will increase its fleet to 16 of these new-generation helicopters. As part of Airbus Helicopters' commitment to a smooth H175 introduction, it has assigned technical crews to Den Helder, which are backed by the company's full resources in support and services, as well as established training capabilities. The H175s joined NHV's rotorcraft fleet that also includes Airbus Helicopters-built AS365N3 Dauphins, H225s, AS332 L2 Super Pumas, H155s and EC145s. Airbus Helicopters developed the H175 to meet evolving mission needs in the oil and gas industry, offering outstanding performance and unmatched cost efficiency - with the capability of carrying a full payload to 90 percent of the North Sea's offshore installations. It also is well tailored for search and rescue in support of such off-shore operations, emergency medical services, public services, VIP and executive transport. 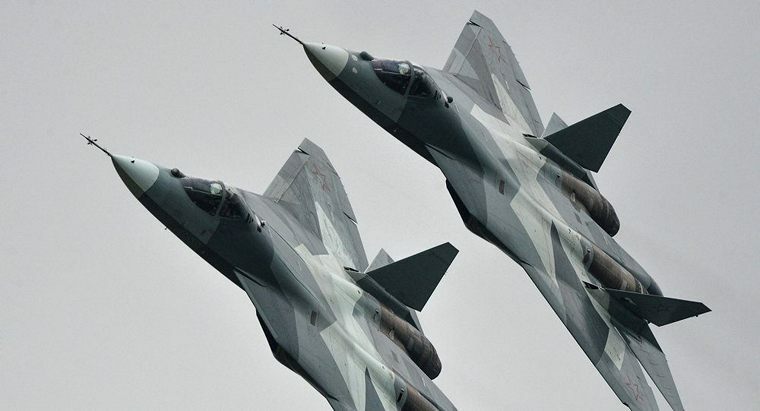 Air and Space Forces Commander Colonel-General Viktor Bondarev announced on Wednesday that Russia's fifth generation T-50 fighter, created by the country's Defense Ministry, displayed excellent results during test flights to confirm its advanced characteristics. He made the statements at the International Aviation and Space Salon MAKS-2015, which is being the Moscow suburb of Zhukovsky. "The tests are in full swing. Flights to test the missiles used for combat have been launched. The fighter shows excellent results," Bondarev said. He stressed that the T-50 fighter (also known as the PAK FA) showed high flying quality during Tuesday's demonstration flights. Boeing [NYSE: BA] will provide the first P-8A Poseidon maritime surveillance aircraft for Australia and additional P-8As for the U.S. Navy following a $1.49 billion contract award from the Navy for 13 aircraft. This latest award puts Boeing on contract to build the Navy's second lot of full-rate production aircraft, bringing the U.S. Navy's fleet total to 62 P-8As. Boeing has delivered 28 Poseidons to date. Based on Boeing's Next-Generation 737-800 commercial airplane, the P-8A offers the worlds' most advanced anti-submarine, anti-surface warfare and intelligence, surveillance and reconnaissance capabilities. The Navy has deployed the first two P-8A patrol squadrons since operations started in 2013. Australia's participation in the P-8 program began in 2009 when the government signed the first in a series of memorandums of understanding to work with the U.S. Navy on system design and development. The U.S. Navy and the RAAF also established a joint program office that operates at Naval Air Station Patuxent River, Md. 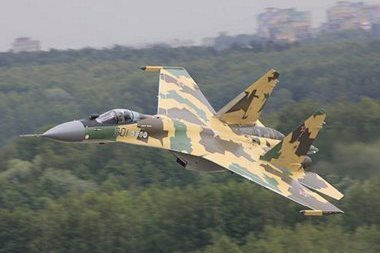 The Sukhoi Company transferred a batch of Su-35S fighters to the Russian Air Force. 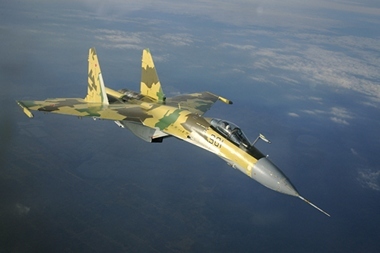 The aircraft were produced in line with the State Orders for the military hardware supplies to the Air Force of the Russian Federation stipulated by the State Armaments Program for 2011 - 2020. Implementation of the Orders will provide for a deep modernization of the Air Force and will guarantee a high stable work load for the coming years for the Sukhoi Company and its partners. The Su-35S is a deeply modernized super-manoeuvrable multirole fighter of the �4++� generation. The applied technologies of the 5th generation provide for the Su-35S superiority over similar class fighters. The aircraft has a much better flight characteristics compared with standing analogue fighters and more perfect on-board avionics. Many technical characteristics of the aircraft exceed the ones of the foreign analogue fighters in service. Embraer Executive Jets today announced that its new Legacy 450 business jet received type certification from the U.S. Federal Aviation Administration (FAA). The approval comes a few weeks after the aircraft earned certification from Brazil's civil aeronautics authority (ANAC). The Legacy 450 comfortably seats up to nine passengers and is the only mid-light jet featuring a 6-foot-tall cabin and a flat floor. Its cross section - 6 feet 10 inches - is the largest in class, five inches wider than its nearest competitor. The first Legacy 450 delivery is scheduled for the fourth quarter of 2015.